Alaskans will soon vote on Ballot Measure 1, the controversial initiative aimed at protecting Alaska’s salmon habitat. Companies behind big proposed mines and oil developments have helped raise millions of dollars to campaign against it. But beyond big resource development projects, opponents say Ballot Measure 1 could hinder projects like road improvements. Supporters counter that it was specifically written to allow vital infrastructure projects to go forward. So how will the ballot measure affect mid-sized projects used by everyday Alaskans? The answer isn’t clear-cut. That’s because if it passes, projects that could cause “significant adverse effects” to salmon habitat will go through a much tougher and more public vetting process to get what’s called a major permit. Projects that impact salmon habitat in less significant ways could get a minor or a general permit, and that process would be less rigorous and time-intensive. So what counts as a “significant adverse effect” on salmon habitat? Where’s the line between a major and a minor permit? “We have not made an actual determination about that yet,” said Ron Benkert, a regional supervisor with the Alaska Department of Fish and Game, the agency that would carry out the ballot measure if it passes. Benkert said the measure does lay out criteria on what counts as “significant adverse effects.” For example, if a project blocks fish from passing through, that’s “significant.” Other criteria on what counts as “significant” are less clear, he said. “Some of them are kind of difficult to define and it would probably require us to develop some additional regulations to further clarify that,” Benkert said. So if the measure passes, that’s not the end of the story. Although it will go into effect 90 days after the election results are final, the state will likely write regulations that would try to nail down the distinction between projects in salmon habitat that have to clear a higher bar and projects that won’t. Benkert said that could take several months, if not longer, and would require significant input from the state’s Department of Law. “I’ve been involved in a lot of rulemakings over the years; this one is going to be as hard as anything I have ever seen, just because there’s so much interest in it,” said Eric Fjelstad, an attorney with Perkins Coie, a firm that also has worked for the Stand for Alaska campaign. The state can likely put little projects like boat ramps under the “minor” category. And a big proposed mine that will displace salmon streams? That will go through the tougher permitting process. “The clients I represent — everyone just assumes they will be major,” Fjelstad said. But Fjelstad said the gray area in the middle will be tricky for the state to navigate. Emily Anderson, an attorney with the Wild Salmon Center who helped write the initiative, pushed back on opponents who have said needed infrastructure projects will be hindered by the ballot measure. “I think Fish and Game will write regulations that reflect the intent of the law, which is not to overly burden everyday Alaskans or to stop vital infrastructure projects or anything like that,” Anderson said, stressing that the projects would only need permits if they “use, divert, obstruct, pollute, disturb or otherwise alter” habitat for salmon and other, similar fish species. Anderson acknowledged it’s hard to pinpoint exactly what projects will get a minor permit, and what projects will go through the tougher vetting process, because Fish and Game will have discretion on that. She added the measure isn’t focused on how big or small a project is, or what kind of project it is. 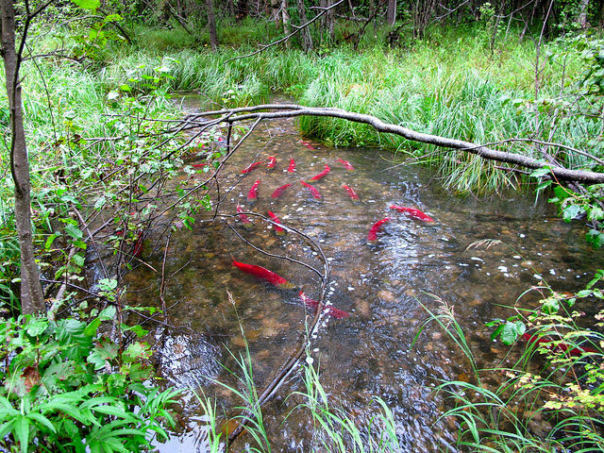 Instead, the bar is to what extent it could harm salmon habitat. So a project’s size may not be the best indicator of how much it could be impacted by Ballot Measure 1. And even then, when it comes to how the initiative could impact some projects used by everyday Alaskans, a lot rides on how the state writes regulations to implement it. But before all that, Alaskans will vote to decide whether the ballot measure should go forward at all.